Hipparchus and Ptolemy who introduced epicycles, eccentrics, and equants respectively to increase the accuracy of the prediction. During the fall of Rome in the 4th and 5th centuries and the Early Middle Ages (c. 6th to 10th centuries), astronomical progress was sparse in Europe. There were only a few notable exceptions such as Martianus Capella of Carthage. In contrast to the Ptolemaic system where all the 'planets' orbited the Earth, Martianus proposed that Mercury and Venus orbited the Sun, with the Sun then orbiting the Earth. His work was later referred to by Copernicus. While progress in Europe was slow, Islamic astronomy flourished. A translation centre known as the House of Wisdom was established in Baghdad. 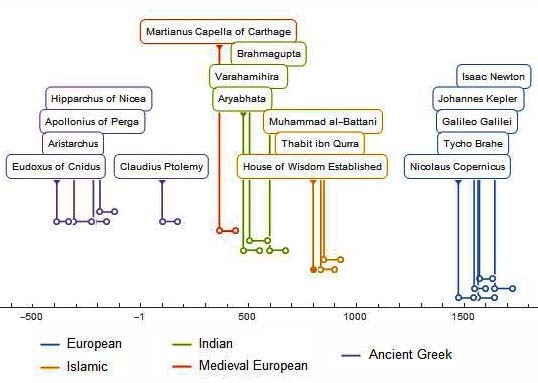 This allowed astronomical works from a range of traditions such as Greek and Indian astronomy to be assimilated into Islamic thought (important Indian astronomers include Aryabhata, Varahamihira and Brahmagupta). Over the coming centuries debates arose over the validity of the Ptolemaic model with astronomers such as Thabit ibn Qurra drawing out inconsistencies between Ptolemy's geometrical model of the solar system and his physical view of it. On the other hand al-Battani greatly respected the Ptolemaic model and amended it by improving the model's treatment of the orbit of the Sun around the Earth. His work was cited at least twenty-three times in Copernicus's De revolutionibus published in 1543. In this work, Copernicus aimed for a more elegant model, that disposed of the Ptolemaic equants. This attracted fervent support from Galileo. However, to achieve anything like accuracy, Copernicus had to place the sun a bit away from the center of the universe, and use even more epicycles than Ptolemy, which complicated the model. Other astronomers such as Brahe and al-Battani had developed geocentric models that gave more accurate predictions than the Copernican view, which therefore failed to catch on. Kepler then made a groundbreaking advance. He postulated that the planetary orbits were elliptical instead of circular, going against the centuries-old view held by those influenced by Greek philosophy. Using this hypothesis, he was able to predict the transit of Mercury across the face of the Sun, for the first time in human history. However, 50 years on the leading astronomer of the day Cassini still held a geocentric view as proposed by Brahe. It was not until Newton used Kepler's laws as proof of his law of universal gravitation in the Principia that the heliocentric model really began to gain ground. However, problems such as the lack of observed parallax remained (see Reaches of the Milky Way).